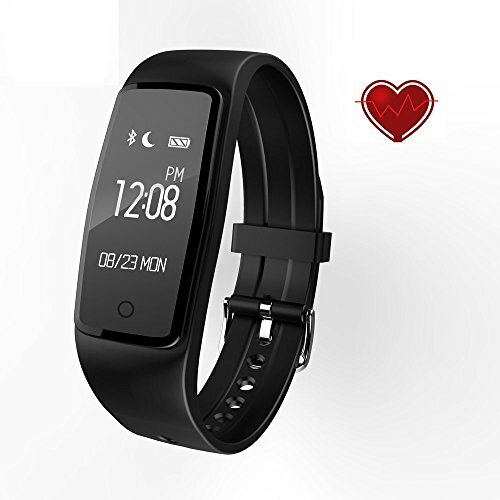 SCONFID fitness band tracker with Heart Rate Monitor, make your health online and simple. Accurately monitor the total effective sleep time every night. Let you more detailed understanding and improve the quality of sleep. About 1.5 hours full charge, Working 5 days (with Automatic HR Monitoring ON), 8 days (with Automatic HR Monitoring OFF). Bluetooth 4.0; Android 4.3 & above; IOS 8.0 & above. wearable length between 5.5 inch min and 8.3 inch max. If you are not satisfied with our products, 30-day money-back guarantee for any reason. We have a professional technical guidance team. Free to contact our seller customer service by mail if you have any questions on the operation. PEDOMETER AND CALORIE BURNING MONITOR: This waterproof bike fitness tracker recognize sport mode and record steps, distance and calories consumption automatically, and the GPS can show your moving route. HEART RATE MONITOR WATCH: The hr fitness tracker can monitor heart rate automatically and continuously on your wrist. You can check your history heart rate data in the app. AUTO SLEEP TRACKING: The fitness activity tracker can automatically monitor your sleeping state and record all of your sleep progress, identify your deep sleep and light sleep hours. OTHER POWERFUL FUNCTIONS: The fitness band tracker has more powerful functions like music Control, Remote Camera Shoot, Find phone, Date/Time Display, Clock Alarm, Incoming Call and SMS Reminder, Social Software(such as Facebook , Twitter, WhatsApp) Message Reminder. WIDELY COMPATIBLE: Connect with your smart phone by Bluetooth, support 4.0 version, compatible with Android 4.3 ,IOS 8.0 or above. Download the Free App by scanning the QR code printed in the manual, and quick pairing. If you have any questions about this product by SCONFID, contact us by completing and submitting the form below. If you are looking for a specif part number, please include it with your message.